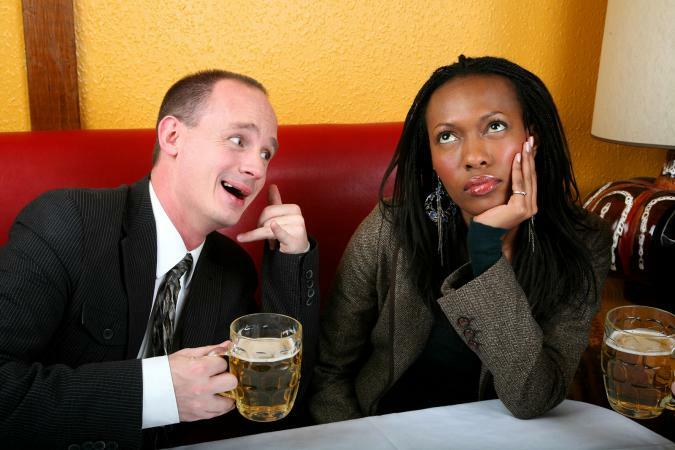 You've probably been in this situation before: chatting with someone while wishing you could end the conversation. The problem is, you may not always know how to extricate yourself without hurting the other person's feelings (and making yourself like a jerk while you're at it). The next time you're faced with this situation, try one of these methods. It's a common in this situation to use an excuse that shifts responsibility onto the other person, suggesting he or she must be busy or need to get off the phone. This can backfire, though, if the person protests he or she has plenty of time. So try taking the responsibility yourself, instead. Suggest you have a long list of chores you need to knock off, so you need to wind up your chat. This lets you take the blame, helps you avoid hurt the other person's feelings, and has the advantage of almost always being true. Using the excuse that you've got a call coming is so common there are even apps that can help you. Try this instead: Tell the person you're talking to that you really need to excuse yourself to call someone, either to a parent, a sick friend, or your child. This works because it never hurts to call that other person, and you completely avoid any risk of being dishonest and, what's worse, getting caught in the act. To avoid hurting the other person's feelings while ending a conversation you want out of, try asking the person to do something with you. This could be going to meet the speaker or going to get a refill at the bar ("I need to refresh my drink; want to come? "), whatever breaks up your one-on-one by introducing the possibility that someone or something else will naturally break up your conversation even if it's just by bringing a third person into it. Any excuse that helps you seamlessly accomplish your goal while doing something nice for the other person is especially effective. This excuse is involves a little improv, and that's what makes it both fun and effective. Grab two drinks or two little plates of food to carry, and when the conversation wanes, suggest simply that you need to go find the person for whom the drink is intended. Not in a situation with refreshments? No problem! If you're at a conference, for instance, where there's no food, it's easy enough to arm yourself with a business card someone else would like or an extra set of session notes. Some manners authorities hold that excuses aren't typically necessary, for instance, when declining a dinner invitation. The same holds true here and in that spirit, you can simply look the other person directly in the eye, offer a genuine smile, and tell him or her how nice it's been talking with them. Then you're free to turn and go. What's so effective here (but what makes it potentially more difficult) is the complete absence of an excuse. You're being honest, but that can sometimes be tough to dish out. It's often possible to delay the inevitable end of the conversation by hinting that you'll return to keep chatting if time allows later on. ("Maybe we can keep talking at the gala tonight, if we see each other," or "I'll circle back later if I can, but right now I have to run.") If you're vague, the other person will likely understand it may not happen, yet it's not completely dishonest. Rather, it's a soft and undefined close to a conversation that can help you make an escape while preserving a relationship. Anything that blurs or camouflages the end of the conversation is helpful to letting both of you wind it up gracefully. A great way to do this is with a little preview of the end of the chat: "I need to get going, but before I do, I want to let you know about a great event happening soon in your neighborhood." You can then spell out a few details, or you can get a short answer to a question you might have ("I have to run, but before I do, is little Suzy over her bad cold?") and then excuse yourself. Best bet: Make this last kernel of conversation either a yes-or-no question or a piece of information you share. The last thing you want to do is open the door to a new topic of discussion. Can you plan ahead or improvise? Keep your phone charger in view or carry another prop you might reasonably need to do something with or give to someone: "Would you excuse me? I need to go charge my phone," or "I told Melanie I'd give her this article to read," or even "I really need to throw away this plate." Somehow a visual makes what's happening more real and palatable and since it's hard to argue with, prevents the other person from continuing a conversation you want to end. Try focusing on making the other person feel good while laying the groundwork for your retreat. You could say something about how interesting the discussion has been, what fascinating work he or she does, or anything else that's likely to make the other person feel great (while also, ideally, being true). The best approach is to fold into what you're saying the idea that you need to leave to do something else. ("This has been an intriguing discussion of the campaign, and I'm sorry I have to tear myself away.") Bored by the conversation and no idea what to say? Everyone has good qualities, so challenge yourself to find the good in your conversation, and share your impressions with the other person, then seal the deal with some version of goodbye. To ease your way out of the conversation, you can steer it to the topic of what you might be able to do for the other person. At an event, for instance, you could ask the person if there's someone he or she would like you to be introduced to. Or maybe something has come up in your conversation that would suggest something else you could offer, such as the promise of a book title to be emailed later, an introduction to make, a new recipe to send, or anything else related to what you've talked about. Close with the promise of following through folded into your departing words: "Ok, then! Great to chat with you, and I'll be in touch with that email later today. Take care!" What makes these parting words is that people love to have others think about what they need and want, and that innate desire helps soften the blog of your departure from the conversation.